How Many Times Has Bruce Springsteen Mentioned Car Brands in His Songs? 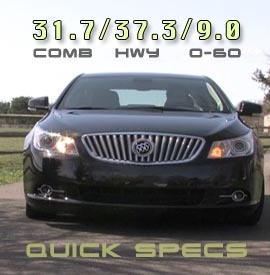 MPG-o-Matic 2012 Buick LaCrosse eAssist Review Summary: The 2012 2012 LaCrosse with eAssist plays the efficiency card, as it targets the more affordable end of the luxury full-size market, with the Lincoln MKS, Acura TL, and Lexus ES350 as its primary competitors. The LaCrosse eAssist mates a 2.4-liter inline four with a lithium-ion battery powered electric motor, which achieves significantly better fuel economy (25/36) than the conventionally powered MKS (17/25), TL (20/29), and ES350 (19/28). When compared to the slightly smaller Lincoln MKZ Hybrid (41/36), the LaCrosse eAssist is an equal in the highway efficiency, but drastically behind in the city. MPG-o-Matic 2012 Buick Verano Review Summary: Buick aims high with the Verano sedan, targeting imported luxury marquees from Lexus and Acura to Audi and Volvo, with a price that undercuts the competition. With a smooth and exceptionally quiet ride, the Verano challenges what has come to be convention. The Verano’s FlexFuel engine and its ability to utilize E85 provides a clear advantage in geographic areas where ethanol is plentiful and significantly less expensive than unleaded gasoline. 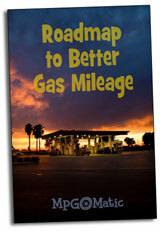 As gasoline prices continue to rise, this capability will become increasingly important. 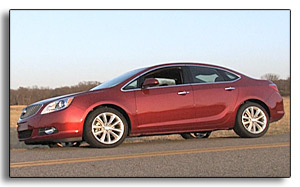 The 2012 Buick Verano is equipped with a direct-injected 2.4-liter inline four cylinder engine and six-speed automatic transmission. The DOHC FlexFuel four produces 180 horsepower and 171 foot pounds of torque. The Verano’s capability to run E85 ethanol offers a significant advantage in certain geographic locations, in these uncertain times.